For other uses, see Carrion (disambiguation). 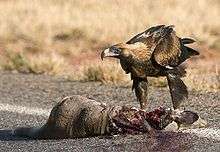 A wedge-tailed eagle and carrion (roadkill kangaroo) in the Pilbara region of Western Australia. Carrion (from the Latin "caro", meaning "meat") is the decaying dead flesh of an animal. Carrion is an important food source for large carnivores and omnivores in most ecosystems. Examples of carrion-eaters (or scavengers) include vultures, hawks, eagles, hyenas, Virginia opossum, Tasmanian devils, coyotes, and Komodo dragons. Many invertebrates such as the carrion and burying beetles, as well as maggots of calliphorid flies and flesh-flies also eat carrion, playing an important role in recycling nitrogen and carbon in animal remains. Zoarcid fish feeding on the carrion of a mobulid ray. Carrion begins to decay the moment of the animal's death, and it will increasingly attract insects and breed bacteria. Not long after the animal has died, its body will begin to exude a foul odor caused by the presence of bacteria and the emission of cadaverine and putrescine. Some plants and fungi smell like decomposing carrion and attract insects that aid in reproduction. Plants that exhibit this behavior are known as carrion flowers. Stinkhorn mushrooms are examples of fungi with this characteristic. A coyote feeding on elk carrion in Yellowstone National Park's Lamar Valley during winter. Another example can be found in Daniel Defoe's Robinson Crusoe when the title character kills an unknown bird for food but finds "its flesh was carrion, and fit for nothing". The thirty-count laws of Ulla (Talmudist) include the prohibition of humans consuming carrion, this count is in addition to the standard seven law count and has been recently published from the Judeo-Arabic writing of Shmuel ben Hophni Gaon after having been lost for centuries. ↑ Hovenden, Frank. The Carrion Eaters Archived 1 June 2010 at the Wayback Machine.. Comox Valley Naturalists Society. 7 May 2010. ↑ "San Diego Zoo's Animal Bytes: Striped hyena". San Diego Zoo. 7 May 2010. ↑ Len McDougall (2004). The Encyclopedia of Tracks and Scats: A Comprehensive Guide to the Trackable Animals of the United States and Canada. Globe Pequot. pp. 274–. ISBN 978-1-59228-070-4. Retrieved 27 November 2011. ↑ "San Diego Zoo's Animal Bytes: Tasmanian Devil". San Diego Zoo. 7 May 2010. ↑ John George Wood (1892). Insects abroad: Being a popular account of foreign insects; their structure, habits and transformations. Longmans. pp. 82–. 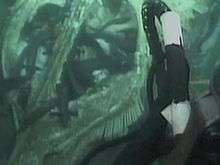 Retrieved 27 November 2011.